Hello everyone! I wanted to post about my latest creation, a life-size replica of the Star Wars Movie Tauntaun with Luke Skywalker. I was originally approached about making just the Tauntaun head as a wall mounted bust, sort of like a deer trophy head. After making just the head the customer was so pleased with it he asked if I would be up to the challenge of making a full size Tauntaun, complete with saddle, harness and reins, a snow base and of course a full scale Luke Skywalker! 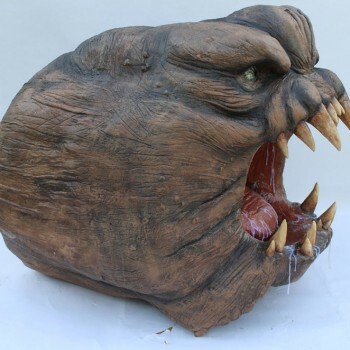 This had always been a prop replica that I had wanted to make so I took the challenge. A lot of research went into this piece, from using the DVD for reference to also finding obscure behind the scenes images of the Tauntaun. 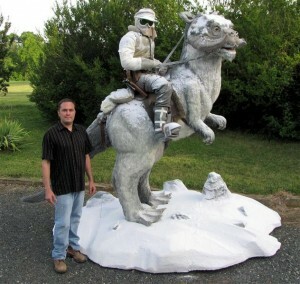 The Tauntaun along with the base is made from Styrofoam. The fur I found online that I had to modify to give it the correct color and look. The Luke figure is a pose-able mannequin that I was able to purchase and modify to the correct size of the actor Mark Hamill who portrayed Luke in the Star Wars Movies. The customer was able to provide the Luke costume so I did not have to recreate that. The saddle I made from fiberglass and the other saddle bags and accessories from found items that I then modified. The Light Saber and blaster are replicas that were purchased online. After finishing the whole piece I then used fake snow to cover the Tauntaun and Luke figure to give it that snowy look! All in all this was a difficult but fun piece to recreate. I appreciate my customer giving me the opportunity to build this piece and also having enough confidence in me to create an accurate replica. Take a moment and view the photos of this project on my portfolio page!